Particularly in this age of vehement digital obsessions, it’s not tricky to observe obsessive teenage mentalities from a relatively safe distance or even unintentionally kick a nest of Beliebers, whose attempts to insult me were as unimpressive as his music at the time. Yet, that idea of swooning over a heartthrob figure is a phenomenon that has taken a while – almost two decades, in fact – for me to fully appreciate. Even though my own teenage years contained sporadic and prolonged infatuations with particular artists and their outputs, these were built on foundations of what was to me groundbreaking musicianship, not through bleary-eyed desire. 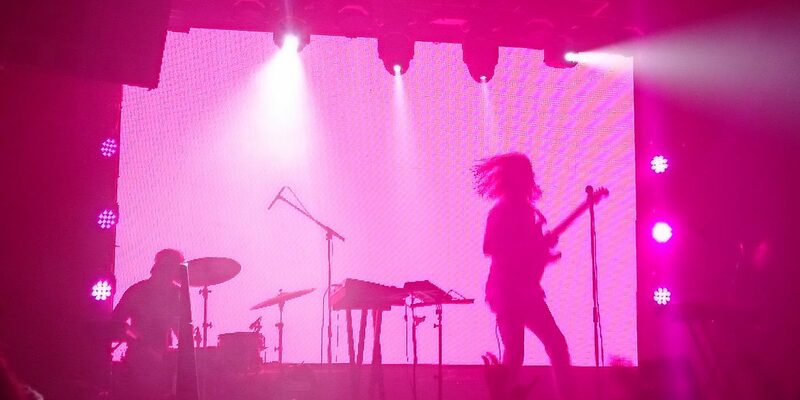 All that changed when I found myself, perhaps foolishly, spending a night before a far-from-out-of-the-way spring coursework deadline at a LANY show. Smitten with ‘ILYSB’ after hearing Zane Lowe suffering from the same sentiment on Beats 1 the previous autumn, their night off from arena shows with Ellie Goulding and John Newman took them to Camden’s Assembly (then Barfly), where a quaint capacity crowd was treated to an intimate and sweaty performance of, at that stage, the band’s entire discography. As frontman Paul Klein spoke modestly about the band’s feeling of overwhelm by the love they were receiving through his matted mane of flowing locks, almost everyone hung off and echoed every one of his words, even though new single ‘WHERE THE HELL ARE MY FRIENDS’ was just three days old. Not even six months on, things have progressed quickly. Now, the Nashville-sourced band of Klein, drummer Jake Goss, and everything-else-person Les Priest is holding its own series of dates across the country they revere to the point of referencing twice on June’s surprise kinda, released through Polydor. Having scheduled four gigs in the aftermath of appearances at Reading and Leeds, two had to be swiftly moved due to demand, resulting in their London date rushing across the city to Heaven from the unfortunately-named Dingwalls to allow for more than triple the crowd. Klein was quick to note – barely two lines into opener ‘4EVER!’ – that this made it their largest headline show yet and, even though it wasn’t as claustrophobic or affably feral, quite possibly the loudest. Again, the setlist was a near-complete journey through their collection, though ‘Hot Lights’ and ‘I Don’t Care’ were displaced by the five new kinda tracks that have appeared since that last show. With the exception of inevitable encore ‘ILYSB,’ it was this material that unsurprisingly appeared most familiar to the audience, forged of lovestruck couples, adoring teenage girls, diligent and enthusiastic parents, burly athletic types, suitably-attired supporters in their black caps and white jumpers draped in ‘pink skies’ lyrics, and anybody else vulnerable to an alluring spot of easygoing pop idylls. Though at times (well, ‘current location’) in the studio Klein can appear so relaxed that intention slips by the wayside, that fusion of the dreamy sound and an adoring crowd that transcends demographics appears to draw the utmost from his demeanour. With Goss and Priest flanking his shoulders and focusing on their respective duties of deceptively intricate percussion patterns and comforting melody without extravagance, Klein took advantage of the larger stage area to expand upon hair flicks and emoji-like arm gestures. Often it seemed like the guitar round his neck was merely an accessory that was removed for freedom to channel, instrument in hand, Chris Martin’s crouching or jig in front of a Forrest Gump GIF montage. From a delectable band whose trajectory seems infinite and finale comes preceded by a voicemail from the drummer’s mother, would you expect anything else?